As a part of my Interfaith Seminary homework this semester, I was instructed to pick a religion not covered in our curriculum and write a brief summary of the basic beliefs and rites of that religion. I chose one that I have been fascinated with for quite a few years, Yazidism. I apologize to any Yazidi who read this and find it incorrect or too simplistic an overview of your ancient culture and traditions. I wrote this with nothing but the greatest respect for Yazidism and the Yazidi people. Yazidism is the religion of the Yezidi people, an ethnically Kurdish religious community indigenous to Northern Mesopotamia. They live primarily in Northern Iraq/Kurdistan and speak Kurmanji, the Northern Kurdish language. They have migrated throughout the region into Armenia, Turkey, Syria and Iran though most have continued to migrate into Europe. They have been persecuted by neighbors for centuries, with the most recent persecution and genocide starting in 2014 by the Islamic State group in the campaign to cleanse the area of all non-Islamic influences. The Yazidi trace themselves back to the Garden of Eden and consider themselves to be the descendants of the son of Adam, with their present religion dating back to the last Floods or approximately 6,000 years ago. At that time, they moved throughout India, Afghanistan, and North Africa before returning to their homeland in Northern Iraq. They consider themselves to have helped create the Sumerian, Babylonian and Assyrian civilizations. In the 11th Century, the Yazidi culture and religion was reformed by the Sufi, Sheikh Adi. With the guidance of the Peacock Angel, Tawsi Melek, Sheikh Adi created scripture, hymns and prayers and established the current caste system consisting of the Mir or Prince (the religious head of the Yazidis) and his caste, the Sheikh caste, the Pir and the Murid (the commoners). Within these castes are also the orders of mystics, Faqirs, Qewels and Kocheks. The role of Mir is hereditary and is considered the official representation of Tawsi Melek on Earth. The Yazidis believe in one static, inactive and transcendent God who resided ‘across the water’ and out of a pearl, created the earth, planet and stars. He then created the Seven Great Angels, the leader or Archangel of which is Tawsi Melek or Melek Taus, the Peacock Angel. They believe that good and evil both reside within human beings and it depends on humans themselves to choose, just as Tawsi Melek chose. An important facet of Yazidism is the belief in reincarnation, meaning the soul is not destroyed and changes body after death. This is called Kiras Guhorin (changing of garments). This concept applies even to Divine beings, as they believe the Seven Angels periodically reincarnate into human form or koasasa. The Yazidi see hell and heaven quite differently than many of their neighboring religions. They believe that Tawsi Melek saw the suffering of the world and cried. His tears fell onto the fires of hell and extinguished them. With hell extinguished, and reincarnation, a soul would be reborn repeatedly until rejoining heaven. Another important facet of the Yezidi faith is their oneness with nature. They pray three to five times each day towards the sun, seen as the ultimate truth, sacred and an emanation of God. In Yazidism today, practice or careful adherence to the rules that govern all aspects of life, are more important than scriptures, dogma or personal beliefs. This religious purity, along with reincarnation, are the two keys of Yazidism. Some of these rules are, the caste system, food laws, a variety of taboos, and the preference for living within Yazidi communities and marrying only another Yazidi. One cannot become a Yazidi, they must be born into the religion and ethnic group. Sheikh Adi is the Sufi reformer who lived among the Yazidi in the 11th century and reformed it into what is looks like today. He is considered a divine being and possibly an incarnation of Tawsi Melek. It is believed that as the same time as he was incarnate, the other six Great Angels were also incarnate. Sheikh Adi once stated: “I was present when Adam was living in Paradise, and also when Nimrod threw Abraham in fire. I was present when God said to me: You are the ruler and Lord of the Earth. God, the compassionate gave me seven earths and the throne of heaven.” Sheikh Adi ibn Mustafa was of Umayyad Muslim descent and spent many years among Sufi adepts in Baghdad before settling into the valley of Lalish (northeast of Mosul), after visions instructed him to move north and help save the Yazidis. Part of his reformation was to mandate that Yazidi could not convert to another religion nor could someone from another religion become Yazidi. Sheikh Adi created the caste system of Murid, Pir and Sheikh as well as the Order of Faqirs. Upon his death, he was entombed in Lalish, the spiritual Heartland of the Yazidi and where they find spiritual solace as well as physical protection during times of persecution. Lalish is also considered the landing place of Tawsi Melek. Yazidi pilgrims from around the world travel to Lalish to visit his tomb and receive his blessings. There are also tombs dedicated to six Great Angels who were incarnated with Sheikh Adi, shrines to the miracles of Sheikh Aid and landmarks said to have been transferred from Mecca. For most of the history of Yazidism, the scriptures have been transferred orally rather than in writing. The books that exist now have much controversy surrounding their authenticity and authorship. These are: Cilwe (The Book of Revelation) and Meshefe Res (The Black Scripture). These are both composed in the southern Kurdish dialect but their stories are the same as the oral stories in the northern Kurmandji dialect. The funeral prayer – Talqina Ezdiyan – warns those who do not accept ‘The Black Scripture’ that the time will come when people would not utter the names of Jesus, Moses or Muhammad; they would ask Sheikh Adi to be merciful upon them. So, even though these books fail to meet criteria normally used to judge authenticity, the contents seem to be validated by the oral tradition. The core religious texts are the qawls, hymns in Kurmanji which make allusions to events and persons not explained in the texts. These have been orally transmitted, with the recitation and knowledge of them kept by the Qewels, Now, various Yazidi communities around the world are attempting to collect and transcribe these qawls for the education of the children. 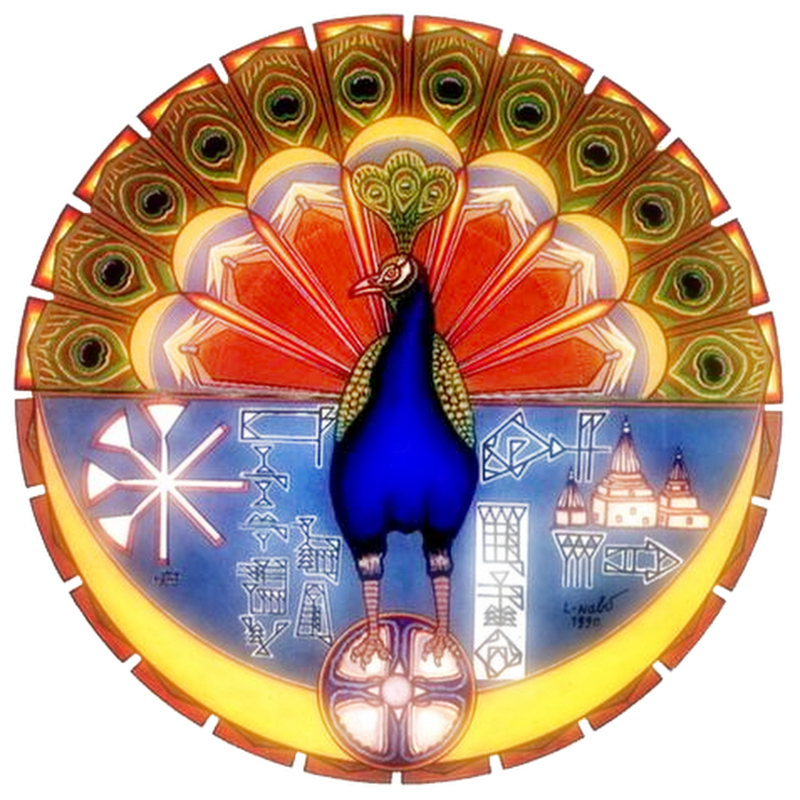 The Yezidi religious year includes four Holy festivals: The New Year, The Feast of Sacrifice, The Feast of Seven Days September 23-30, and The First Friday of December feast following three days of fasting. The New Year is celebrated on a Wednesday in April and commemorates when Tawsi Melek first came to Earth. Part of this celebration is the coloring of eggs, which represent Tawsi Meleks rainbow colors displayed in his form as the Peacock Angel. Women also place blood red flowers and shells of colored eggs above their doors so that Tawsi Melek can recognize their homes. New Years day starts with a feast for the dead, in which women mourn the dead and feast between the graves. One of the most important events of the New Year is the Parade of the Peacock. Bronze lamps or Sanjaks are paraded through the villages. Of the seven original Sanjaks only two remain. In mid-February is a forty day fast observed only by the Yazidi holy men in Lalish. At the completion is the Feast of Sacrifice, which commemorates when Abraham attempted to sacrifice his son Ishmael but replaced with a sheep. The holy Men make a pilgrimage to Mt. Arafat, sacrifice a sheep and then light sacred fires all over the valley. At the beginning of October, the Feast of Seven Days is a sacred time when the Yazidi make the pilgrimage to Lalish to unite as one people at their holiest shrine. They believe that there is an upper, heavenly Lalish where the Seven Great Angels shower blessings down on those in the lower, earthy Lalish at this time. The Sacrifice of the Bull takes place on the 5th day and signals the arrival of Fall. During this week there are continual baptisms of children and holy objects. The Three Day Fast of December is expected to be observed by all Yazidi from dawn to sunset, with nights of feasting and prayer. The Yazidi are concerned with religious purity and are concerned with the mixing of things seen as incompatible, which is seen in their caste system as well as taboos affecting everyday life. Some of these taboos are: the prohibition of eating lettuce or wearing the the color blue. The purity of the four elements are also protected by taboos such as no spitting on earth, water or fire. They consider too much contact with non-Yazidi to be polluting and avoided military service to avoid living among Muslims. This aversion to mixing with non-Yazidi maybe be what lead to the taboo against writing and reading, preventing the literary transmission of their religious tales in books and manuscripts. Yazidi pray between three and five times a day, though prayer is a personal choice and not a mandate.